Sun poisoning is miserable. It hurts, it makes you feel super sick, and it makes your skin look terrible. It can also lead to very dangerous complications. The vast majority of people's sunburns and sun poisoning end up being little more than a temporary painful irritation. That doesn't, however, mean that severe sunburns are a walk in the park. They're not. There are two real dangers you have to worry about. Despite the name, sun poisoning isn't a poisoning from the sun. Sun poisoning isn't even a real medical term. It's a lay term that we use to describe a super severe sunburn or a sun allergy. You might feel like the sun did poison you. Some people get so sick from a severe sunburn or poisoning that they think they could be dying. It's highly unlikely that you could die from sun poisoning, despite how miserable you may feel. If you treat the burn immediately and stay out of the sun while your skin heals, then you will be fine. ​The dangers lie in any complications that you may have. Your condition can become dangerous if you don't treat it. 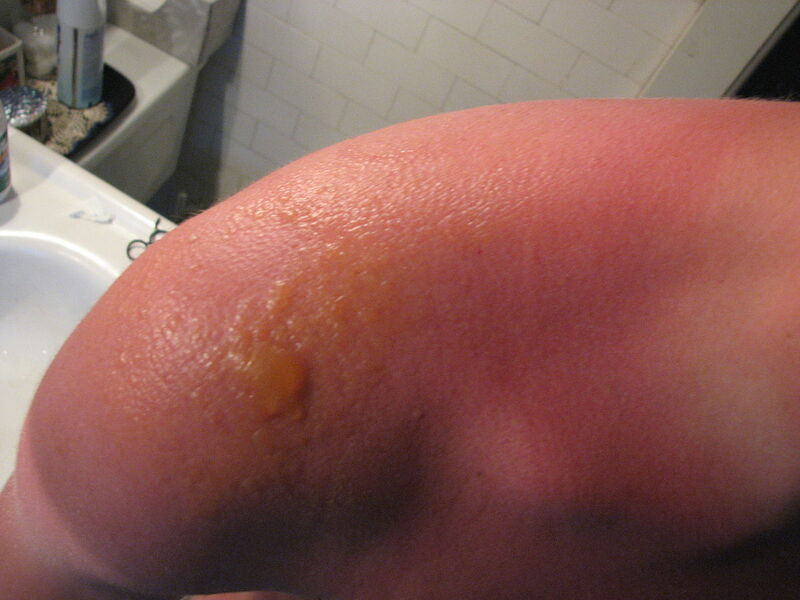 Sun poisoning is the term that we use to describe severe sunburns. It can sometimes be difficult to tell the difference between a nasty sunburn and sun poisoning because they are very similar. Poisoning is worse, and it usually goes hand in hand with a sun rash, blisters, and symptoms of the flu. Acute is the most common type and generally passes without any real complications after treatment. ​Chronic is severe, and the symptoms last longer. ​Any way you slice it if you suspect sun poisoning, see a doctor immediately. You're not going to know which kind you have, and you want treatment right away. Generally speaking, the more severe your burn is, the more painful it will be, and the worse your symptoms will be. More severe burns will also last longer. ​The sun is about 93 million miles away from Earth, and it's rays take about 8 minutes to reach us. The vast majority of sunburns fall into the mild or moderate categories. ​Minor to moderate sunburns will last from three days to a full week, peaking after 24 hours. You may also notice that your skin gets very itchy after a few days and starts peeling. Mild to moderate burns heal on their own, don't require a doctor, and generally don't lead to any dangerous complications. The pain from this type of sunburn will start fading after 48 hours. If your sunburn lasts for longer than a week, or if your symptoms are getting worse over time, then it falls into the severe category. ​If you have a severe sunburn or sun poisoning, then you need to see a doctor right away for treatment. A severe burn is much more painful than a regular sunburn. ​Pain that lasts for several days, up to a week, and in some cases even longer. ​It is crucial that you treat a severe sunburn or poisoning right away. If you don't, the symptoms will last longer and can get even worse. You're going to blister, but you have to resist the urge to pop them because they could get infected. If they pop on their own, clean your skin with mild soap and water, and cover the area with a wet dressing. Also, whatever you do, keep your burnt skin out of the sun until it heals completely. It's tough to tell the difference because sunburns and sun poisoning are very similar. They are both caused by overexposure to UV radiation from the sun or a tanning bed. That's right, a tanning bed. The biggest difference between them lies in the severity of the burn. ​Getting a base tan cannot prevent sunburn. Sun poisoning is not just a burn. It's an allergic reaction by your skin to excessive exposure to UV radiation from the sun or a tanning bed. Just like with a sunburn, the severity will depend on how much time you spent out in the sun, especially if you weren't wearing sunscreen. ​With severe sunburns or poisoning, expect the same symptoms as a sunburn and then some. ​If you are experiencing the symptoms on this list, seek medical treatment immediately to prevent further complications. There are two hidden dangers with sun poisoning. The most likely complication from severe sunburns you might have is dehydration. Pairing with this, your electrolytes can get all out of wack. Seeking a doctor immediately is key because extreme cases can lead to infection, shock, and even death. 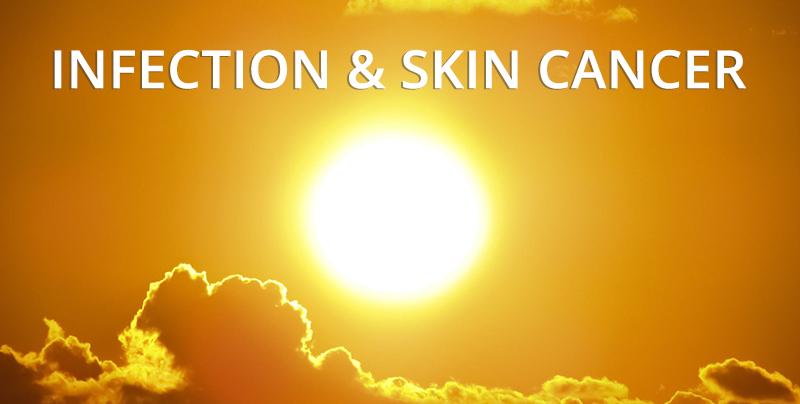 The number one cause of skin cancer is exposure to UV radiation from the sun or tanning beds. And, no, tanning beds are not safer. Most tanning beds use UV bulbs which give you very similar radiation to what you get from the sun. ​One American dies every hour from skin cancer, and the overwhelming majority of these cancers are caused by overexposure to UV light -- there's no question about that. ​Skin cancer is the most dangerous risk associated with sunburns and sun poisoning. When your skin gets exposed to too much UV radiation, it causes mutations in your skin cells' DNA. According to the Cancer Research UK, if you get a sunburn just once every two years, you will triple your chances of getting skin cancer. ​More people are diagnosed every year in the U.S. with skin cancer than all other cancers combined. One in five people will get skin cancer by the time they are 70. We know the primary cause of sun poisoning is prolonged exposure to UV radiation from the sun. Sometimes there is no known cause at all. But there are also other things that up your chances, like your meds and certain health conditions. 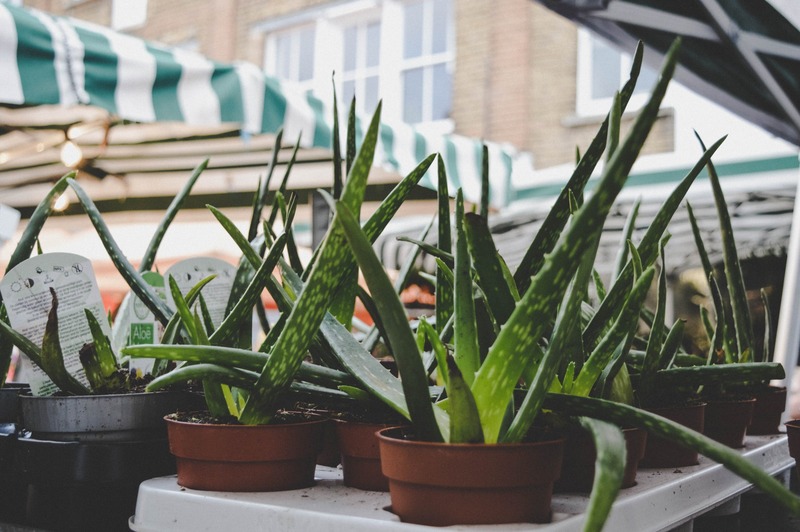 Exposure to certain chemicals like disinfectants and perfume, or some plants could cause a bad reaction to the sun. Even dietary deficiencies and genetic predispositions can be a cause. 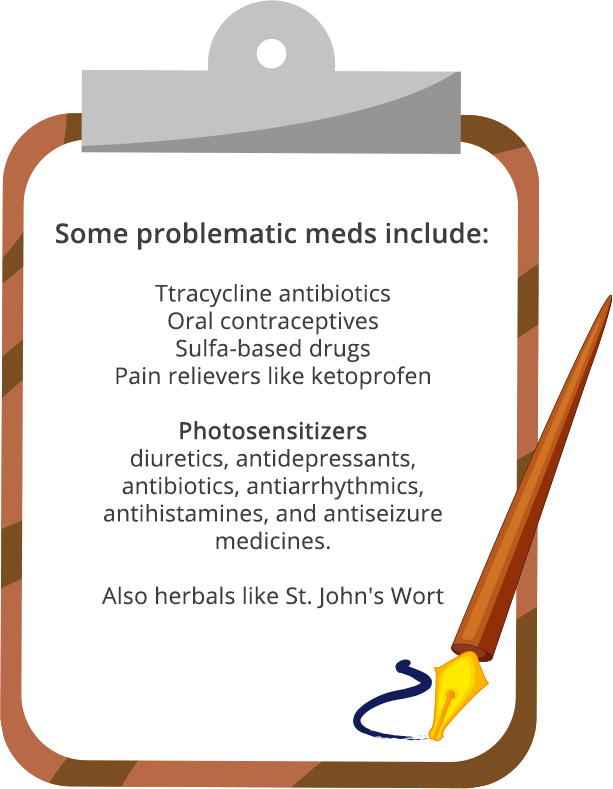 Some medicines can contribute to sunburns and poisoning. Check your medication labels before you spend extended periods outside and remember this word: photosensitizers. ​Most people are not aware that some medications can make them more sensitive to the sun. Unfortunately, they find out when they get a sunburn, especially in the summer months. ​There are also some health conditions that can make you more susceptible to severe burning. Skin conditions like lupus, dermatitis, and eczema all increase your risk. You are also at a higher risk of complications from sunburns if you have a compromised immune system. ​Now let's talk about the risk factors involved with severe sunburns and poisoning. There are several of them. ​You have light or fair skin, exposure to certain chemicals or medications, a skin condition, or a blood relative who has had a sun allergy or skin cancer. ​You thought that was it? Wait, there's more. Another factor that contributes to severe burning is your location. If you live closer to the equator or if you live in a high altitude area you are more likely to burn in the sun. Other risk factors include using alpha hydroxy acids (AHAs), like chemical peels. Because the sun reflects off of the snow, you are also at risk if you spend a lot of time outside during the winter months. If you're out in the snow, you are at very high risk of burning if you're not wearing sunscreen. The snow can reflect up to 80 percent of the UV rays which increases your exposure considerably. And, we already know spending extended periods at the beach or on the water increases your risk because of reflections off the water. You can most certainly get a sunburn or even sun poisoning if you don't use sunscreen or wear protective clothing on cloudy or overcast days. The Skin Cancer Foundation says that cloud-covered days only block about 10 percent of the sun's UV radiation. That's more than enough to burn your skin. If you have a sunburn, no matter the severity, the first two things that you need to do are get out of the sun and drink plenty of water or electrolytes to prevent dehydration. If your skin is very painful, you should take an over-the-counter pain reliever and anti-inflammatory. Take a cooling bath or cold compresses dipped in water or milk. Aloe vera, either straight from the plant or in a gel form, is also helpful. 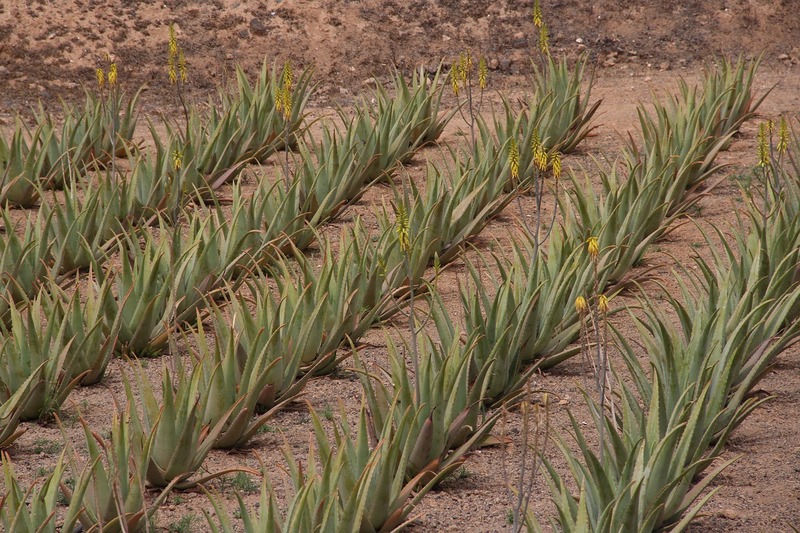 Did you know there are 240 varieties of the aloe vera plant? ​Apple cider vinegar can also help. Just add it to your cool bath. The vinegar will help to balance out your skin's pH, and it will help you heal faster. Another idea is to add baking soda, lavender or chamomile oil to your bath water to reduce pain, redness, and swelling. If your skin is very itchy, try taking an oatmeal bath. Do not add bath salts, soap, or perfume to your bath. If your symptoms are severe and you believe that you have sun poisoning, you need to go to the doctor or the ER. At the hospital, the doctor may treat you with IV fluids for extreme dehydration and oral steroids for the pain and swelling. Your doctor may also prescribe a steroid cream for the painful blisters. For intense pain, they may give you stronger painkillers. One danger with severe burns is an infection. So to prevent and treat that, your doctor will use topical or oral antibiotics. Sun poisoning can blister your lips, and you can't use most of the same treatments on your mouth as you do the rest of your body. Dip a washcloth in cold milk and then hold it on your mouth. The milk will help reduce the inflammatory response in your body. And never ever use ice, lidocaine, or vaseline on your burnt lips. They will make your lips worse. It is essential that you protect babies and children from the sun. ​Johns Hopkins Medicine says that for babies under six months of age, you should keep them out of the direct sun entirely. Dress them in lightweight clothing that covers most of their skin if you're going to be outside, even in the shade. ​All babies over the age of six months need to wear sunscreen. 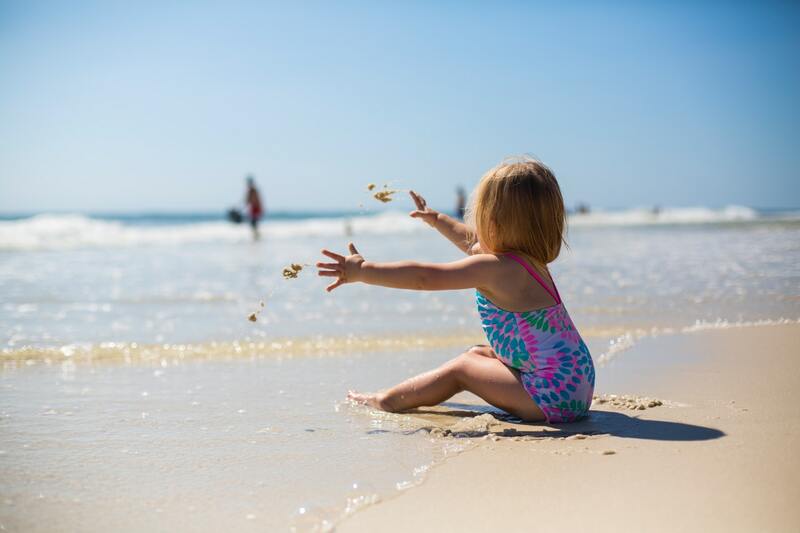 ​Because some children have allergic reactions to some sunscreens, it is essential that you test the product on your child's skin before you use it out in the sun. Put a little sunscreen on your child's wrist while they are indoors. If they have any reaction on their skin or eyes, then you need to choose a different product. And if they do get sunburned, children have some of the same symptoms of sunburn as adults. There are a few things that you can do at home to treat your child if they get burned by the sun. Have your child take a cooling bath or use cold compresses on the burned skin. You can also give them acetaminophen or ibuprofen for discomfort. Be sure that you follow the directions on the bottle and dose them appropriately for their age. For babies younger than six months, check with the doctor before giving them medicine. ​To relieve your child's pain, use aloe vera gel. You can also use hydrocortisone cream or a topical pain reliever. ​If blisters are present with the burn, then see a doctor. You don't want an infection, and you know kids might pick, especially if they're uncomfortable and in pain. And make sure that you give your child plenty of fluids for several days after the sun exposure and keep them out of the sun until they heal completely. The number one thing that you can do to prevent sun poisoning is to wear sunscreen. Choose a water-resistant "broad spectrum" sunscreen with at least SPF 30. ​Although most animals can sunburn, most create their own sunscreen. Although the symptoms might make you feel like you're dying, the fact is, sunburns will surely make you miserable. Keep in mind, the longer that you wait to get treatment, the longer your symptoms will last and the more likely you are to suffer from complications. Severe sunburns are entirely preventable. Protective clothing, hats, and sunglasses, in addition to the sunscreen, are helpful. Plus, if you are more susceptible to burning, you should also avoid the sun during peak hours, from 11 a.m. to 3 p.m.
Now we would love to hear from you. Tell us in the comments section below about your experience with sunburns and sun poisoning. And let us know if you've found any good home remedies that we didn't list.